Most homeowners enjoy small-scale renovations and often complete basic DIY jobs on their own. But when it comes time for a larger project—and hiring a pro to do the work— many homeowners have a number of concerns and fears about the home renovation process. This makes them wary of placing a stranger in charge of their home improvement projects. As a home improvement professional, your job is to alleviate these fears and make homeowners comfortable with you and your business. Here are 4 of the top homeowner fears and some ways to help get ahead of them. For homeowners who haven’t ever hired a professional to complete a home improvement project before, this is uncharted territory. The first time you work with a new client, establishing a positive working relationship is essential if you want to earn their trust. The easiest way to do this is by keeping lines of communication open and explaining the process from start to finish. Answer any questions your clients might have and speak openly and honestly about their fears—including budgets, timescales, and their expectations about the final product. If they know what to expect, your clients will be more likely to trust you to do a good job. 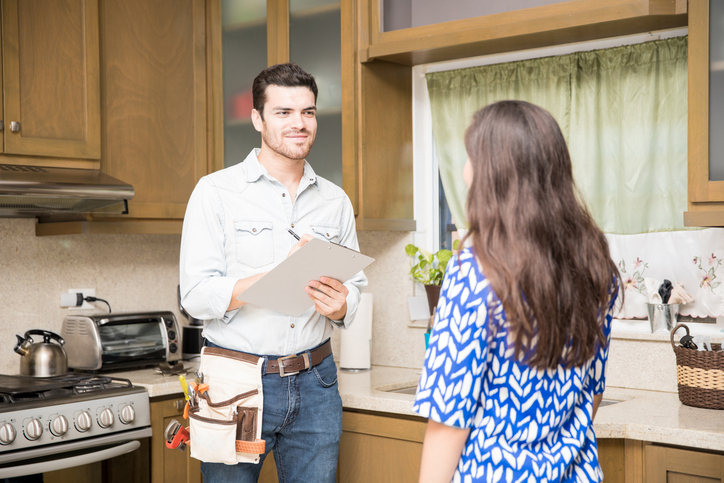 Even if your clients are seasoned home renovators, budgeting a home improvement project will probably cause them some stress. This is completely understandable, since homeowners can easily sink a lot of money into their remodeling projects. As a construction professional, you need to help homeowners understand exactly where their money is going and guide them through the decision making process. Keeping a current pricing structure for your products and services is a great start. Once a client decides to go ahead with a project, prepare an exhaustive estimate of all the building costs (including labor, materials, and other incidentals) and discuss this with them in detail. Finally, show clients some of your past work and reviews, and make sure to add these to your website portfolio. This will help them to feel more comfortable about spending their money on you and to know that you are worth the cost. Will I be able to use my home in the same way during the building process? Will my home be too dirty to live in? Who is going to be in my home? During what times of day? Will the noise and activity anger my neighbors? After all is said and done, hopefully your clients will be pleased with and pleasantly surprised by the results. However, some homeowners worry that the finished project will be less than perfect and not what they expected. Stress relating to the finished project often includes worries about whether the result will look good and stand the test of time. Homeowners also might worry about failure to complete their project and what they might do if they don’t like the result. While you can’t predict the future, you can give satisfaction guarantees to your clients. If, for example, they are unhappy with any part of the completed renovation project, try your best to make it right (or compensate them when this is not possible). As far as these other worries are concerned, regular communication throughout the building project should help to keep clients updated and aware of the progress being made and help them to feel confident that their wishes are being taken into account every step of the way.